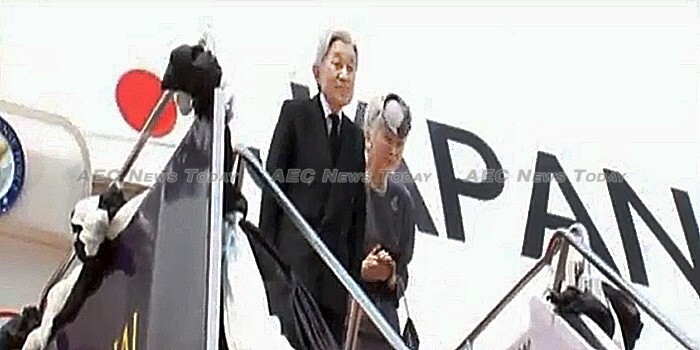 • Japanese Emperor Akihito and Empress Michiko have completed a two-day private visit to Thailand during which they visited the Grand Palace to pay their respects to the late King Bhumibol Adulyadej who died October 13 last year after a reign of more than 70 years, and also met with King Vajiralongkorn Bodindradebayavarangkun. • The Paradonphap Party and the Bhumjaithai Party are the latest Thailand political parties to be invited to appear before the government subcommittee chaired by permanent secretary of defense General Chaicharn Changmongkol to discuss their opinions on reconciliation. • Reconciliation forums have begun being held throughout the country where interested stakeholders are being invited to raise issues relevant to bringing about political harmony. • Government spokesman General Sansern Kaewkamnerd has said that while the government listens to suggestion the use of Section 44 will not be invoked to solve the Southern Thailand conflict. • A seminar in Bangkok has been told that the government continues to work on overhauling the Thailand fishing industry in order to attain sustainability and to eradicate illegal practices, including those that breach Illegal, unreported and unregulated (IUU) fishing regulations. Thailand is working with neighbours Cambodia, Vietnam, and Myanmar to import additional foreign labour and will soon submit a draft law on the management of foreign workers to Cabinet soon. • Thailand Minister of Labour, General Sirichai Distakul, has discussed the concept of reforming the use of fishing vessel and equipment and the management of labour on-board to ensure sustainability in Thailand’s fishing industry in line with the Thailand 4.0 initiative. • According to the National Economic and Social Development Board (NESDB) said that floods and drought in 2016 had resulted in a 4.3 per cent drop in agriculture employment, while the construction, retail, wholesale, and services sectors saw an increase of 0.8 per cent. Average work hours increased to 48.9 hours per week, indicative of economic recovery, while productivity increased by 4.1 per cent. • The Bank of Thailand (BOT) has set Bt15 (about US$0.43) as the highest fee chargeable for money transfer using the ‘Prompt Pay’ system. Transfers of less than Bt5,000 ($142.60) are free. • Those attending the launch of the International Narcotics Control Board (INCB) annual report for 2017 have been told that the number of women who overdosed last year in East and Southeast Asia increased significantly. • Ministry of Science and Technology (MoST) Permanent Secretary Associate Professor Soranit Siltharm has opened ‘Asean Next 2017’ a under the theme of creating smart communities through collaborating in the use of Science, Technology and Innovation (STI). Mr Siltharm said experts from throughout the Asean region were attending the event, which will run until March 10.